In order to use High Performance Computing (HPC) computational resources at LSU, users must first request an account. Any LSU affiliate or a collaborator of an LSU affiliate, including graduate or undergraduate students, may request an account. Accounts and usage of the resources is offered at no financial charge. For more information on other Accounts available at LSU, view Accounts: LSU Overview. 1. Open a web browser and go to accounts.hpc.lsu.edu/login_request.php. 2. 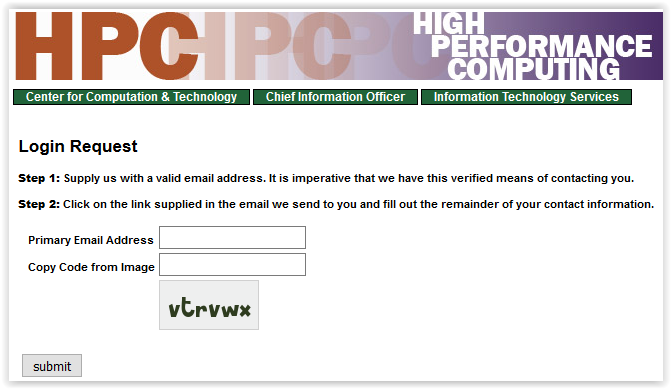 Enter a valid e-mail address into the first box, then copy the code from the image into the code box, then click Submit. Once users have an account they must request an allocation to use HPC computational resources at LSU. To request an HPC Allocation you must visit accounts.hpc.lsu.edu/allocations.php. Users can e-mail. Users can also call the HPC Help Desk at: +1 (225) 578-0900(8:30am - 5:00pm Monday through Friday except University Holidays). If you need to contact individual members of the HPC staff directly, their phone numbers and e-mail addresses can be found in the Staff Listing.